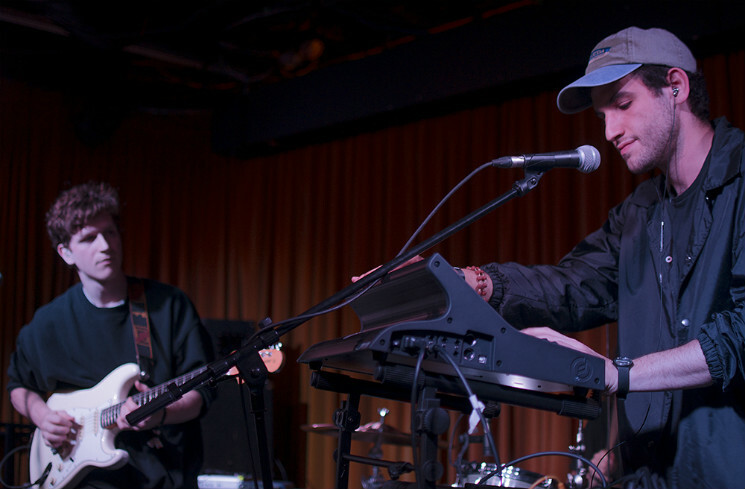 Spending most of the day on a 12-hour bus ride from New York to Toronto didn't seem to wear down experimental duo Ginla in the slightest, as guitarist Joe Manzolia and synth wizard Jon Nellen kicked off NXNE by filling the Drake Hotel with their heavily layered sonics. Eyes hidden beneath his ball cap, Nellen quickly worked his magic behind his sizeable synth setup, triggering beats and ambient swirls while Manzolia contributed gentle vocals and clean guitar accents, which were promptly scrambled by his array of effects pedals. At points, some instrumental layers had a tendency to overpower others, making the complex nature of the arrangements difficult to hear. Having mentioned a willingness to incorporate organic elements into their recordings earlier this year, the duo brought along a live drummer who demonstrated incredible focus and precision behind the kit. Never once outdueled by Nellen's programmed percussion, both the acoustic and electronic accompanied each other well in laying down tasteful grooves, most memorably in the outro section of a danceable new tune that had the crowd moving near the end of the set.